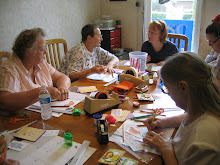 Cootie Coo Creations: June Mini Madness and Another Great Sale! Terry Peattie is the featured artist for the June Mini Madness at The Coo and along with Terry's fabulous classes on Saturday, June 11, and Sunday, June 12, there will also be the continuation of the Craft Front Porch Sale (more items added daily) AND, are you ready for this...20% OFF ALL GRAPHIC 45 in stock (Saturday and Sunday ONLY)...that includes Paper, Pads and Staples - whoop whoop! Wait...it doesn't stop there, if you haven't had a chance to check out the new socks and bags/totes by Blue Q at The Coo, you are in for a real treat! OMG...does the excitement ever end??? Ha ha ha - come join in the fun, treat yourself to some bargains and enjoy the colorful, hilarious new items from Blue Q. I LOVE my job...which is trying to please YOU!!! Have a glorious week!